The Passchendaele Society, with the cooperation of the Field of Remembrance Trust, will be installing a field of 846 named crosses in Auckland Domain in front of the Auckland War Memorial Museum during the month of October in memory of all that died during the Passchendaele Offensive. The PS Board cordially invite any interested members to join us for a short ceremony to mark the establishment of the Field of Remembrance on Sunday 4th October, being specifically the anniversary date of the Battle of Broodseinde which started 4th October 1917. This battle marked the beginning of the Passchendaele Offensive. The ceremony is planned to begin at 7pm and will conclude around 7.30pm with the switching on of the floodlights that will light up the side of the AWWM in poppy-red in memory of all our boys that still lie in Flanders’ fields, Belgium. The planned visual impact will be quite something to see! Wreaths and poppies may be laid. Here is a Field of Remembrance photo in the Domain over the ANZAC weekend. Hits on the Fields of Remembrance website exceeded 8,000 – the field in October will be huge in comparison so we are expecting a significant number of visitors to the Passchendaele website. The Passchendaele Society Board cordially invite all members to attend our annual commemoration to be held at 11am on Monday 12th October inside the Auckland War Memorial Museum. The New Zealand Division’s involvement in the push towards the village of Passchendaele resulted in our worst day in Military history recorded on 12th October 1917 when we lost 846 of our boys on Bellevue Spur on just one day! Please come along and be seated by 10.40am in the WW1 Hall of Memories at the top of the stairs on level two (lifts are available). Please note that seating is limited due to space constraints. The guest speaker this year will be Brigadier Jon Broadley MBE, Director General Reserve Forces & Youth Development. Many military, consular and civic dignitaries have been invited and will be laying wreaths. Medals may be worn and the public are invited to lay wreaths and/or poppies after the dignitaries. The Royal New Zealand Navy Band will be playing from 10.35am and the choir this year is again the Auckland Choral. The Veterans’ Affairs ‘Why Should We Remember Passchendaele?’ competition winner will also be announced and presented with their prize by the Minister for Veterans’ Affairs Hon. Craig Foss. A short play by Jan Bolwell called Bill Massey’s Tourists is on at the Tiny Theatre in the Garnet Station in Westmere, Auckland on September 24th, 25th and 26th. Jan is the granddaughter and tells her grandfather’s story and the play has been described as a ‘tale well told’ and a ‘terrific script’. The Hon. Maggie Barry, Minister for Arts, Culture & Heritage will be visiting Flanders this October to unveil the new Memorial at the bottom of Bellevue Spur dedicated to all those that lost their lives on 12th October 1917 during the Passchendaele Offensive. The monument will be a large scale version of the Nga Tapuwae sign as seen on the Wellington waterfront. The Heartlanders, New Zealanders of the Great War touring exhibition is coming to a town near you, visit http://www.armymuseum.co.nz/whats-on/events/heartlanders-new-zealanders-of-the-great-war/ for more info. The exhibition aims to bring the stories of the brave soldiers who fought in World War I back home to the communities where their journey began. The tour begins October 10th in Palmerston North and ends in Ohakune on Armistice Day. Balls, Bullets and Boots: From Rugby Field to Battlefield by the New Zealand Rugby Museum is another exhibition commemorating the First World War and touring New Zealand. The exhibition will open on August 22 at Te Manawa Museum of Art, Palmerston North. VisitFlanders is an excellent source of information, their flagship WW1 projects are the Facebook page https://www.facebook.com/FlandersFields1418 and the worldwide poppy field. They are also involved in the below initiative. The In Flanders Fields Museum have The Name List Project https://www.facebook.com/FlandersFields1418/app_169161616616325 . It entails a non-stop projection of the names of the people who died exactly 100 years ago and whose deaths were a consequence of the war on Belgian soil, or are commemorated as such. The projection gives a day by day overview of the deaths occurring up until the end of 2018. A website was launched where people all around the world can look up their own relatives among the dead and perhaps even fill in any missing details. The Passchendaele Salute 2017. We have received information regarding a special venture in November 2017. Please see the separate attachment with this email. The newly renamed Defence Blacks will be playing the Belgian National team who will be very stiff opposition indeed (with a number of professional players). See the following http://www.scoop.co.nz/stories/CU1508/S00337/defence-blacks-new-name-for-nzdf-rugby-team.htm about the tour announcement and naming of the ‘Defence Blacks’, and the two ‘posters’ for the games They will be playing for the Dave Gallaher Cup on October 3rd on the grounds of the Passchendaele Memorial Museum, home of our soon to be installed New Zealand Memorial & Garden. 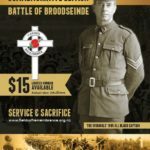 Dave Gallaher as you know was the 1905 ‘Originals’ All Black Captain that was mortally wounded on October 4th during the Battle of Broodseinde in a field less than 2 kilometres from the Passchendaele Memorial Museum. Since the AGM two Directors, Leon O’Flynn and Jamie Wansey, have stood down from the Passchendaele Society Board due to work commitments. In their place Greg Hall and Sandi Notredame have been co-opted to take up the vacant seats during this interim period. Our Secretary, Bob Davis, reports that several emails to members have been returned recently. He asks that if anyone has a change of personal contact data they please remember to advise him, so that we may maintain contact with you. The newly released Jonny Enzed by Glynn Harper is definitely worth a read. It is based on the first-hand letters and diaries of ordinary Kiwi soldiers. These are the lives of the people from our own families who went to war. This is their story. You read their words, you experience what they are experiencing, you live and breathe with them – it’s immediate, vivid, exciting. And you want to keep turning the pages for more. Glyn first began working on original soldiers’ material in the late 1990s, when he worked on the much slimmer volume called Letters from the Battlefield. Since then he has collected an enormous amount of original material and we can now see the fruit of all his research in Johnny Enzed. The letters, the diaries, the first-hand accounts, have been expertly chosen, sifted and organised into this very readable and coherent narrative, one begins to experience the life of Johnny Enzed. You will want to be with him all the way, from the training grounds here in the camps, crossing the ocean to war and life on the frontline. Read exactly what he got up to at every stage of his journey, at the front, on leave, whether he became a mounted rifleman, a tunneller, an engineer or a member of the cyclist battalion. All of their stories are in this book. This is certainly a history book with a difference.